Get ready to move! 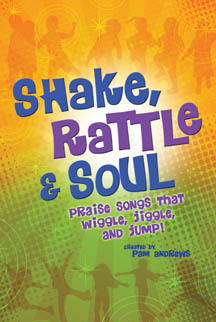 Shake, Rattle and Soul is a new resource collection from the always creative and talented Pam Andrews. It's the perfect way to get the wiggles and giggles out of your children's choir at the beginning of rehearsal getting them energized and focused. The songs are in a variety of musical styles and are pure fun to sing while containing solid Biblical truths. The optional DVD is a wonderful help. Just plug it in and it becomes an instructional sing-along as your kids mirror the movements they see. The songs can then be performed in worship (with movements) if desired, making this a combination rehearsal/performance collection which will give your children's choir Shake, Rattle and Soul!